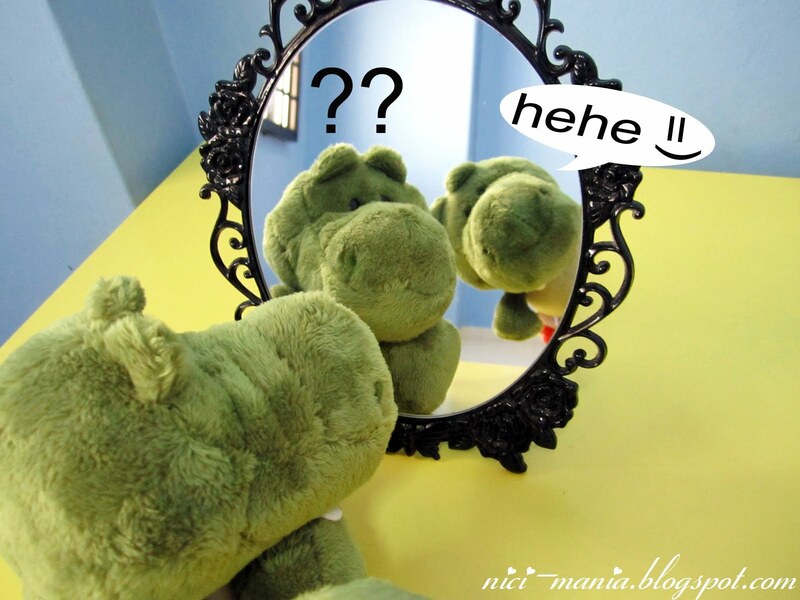 Once upon a time, minily NICI crocodile plush who thinks he is the cutest crocodile plush in the world looks into the magic mirror one day and begins to ask..
Mirror mirror on the wall *ahem* table..who is the cutest crocodile plush of them all?! 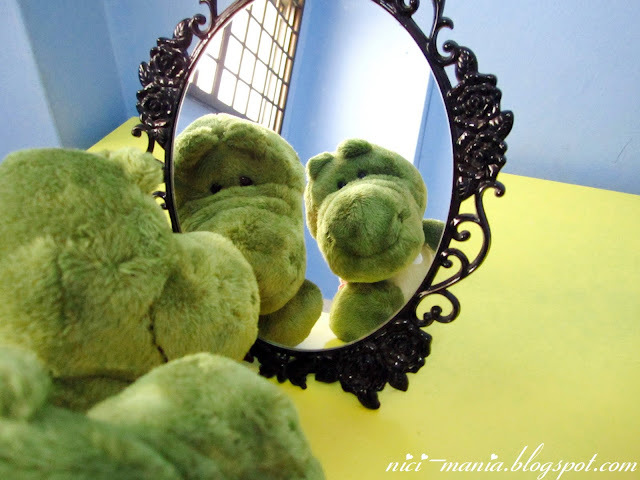 Image of another crocodile plush appears in the magic mirror and stuns our minily NICI crocodile plush. Disgruntled in agony, our NICI crocodile plush exclaimed, "Who are you! How dare you spout nonsense!" 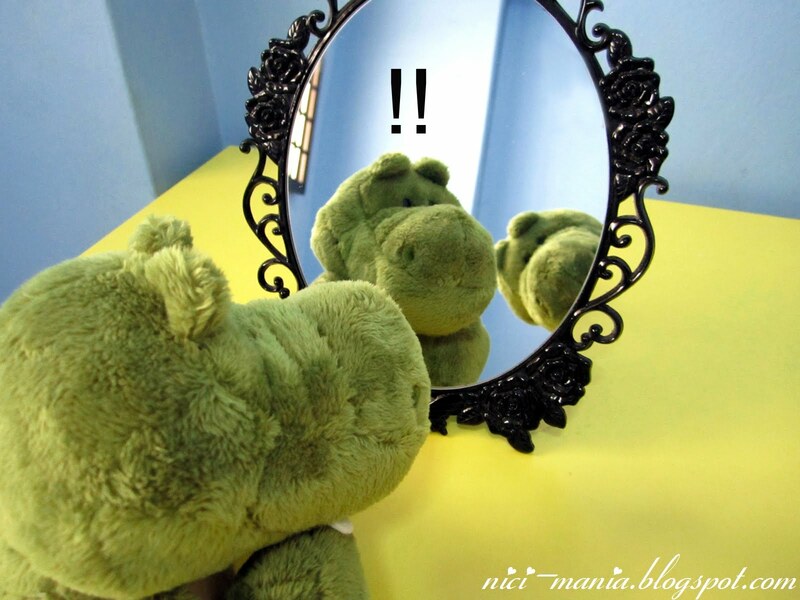 Distant voice closing in, "I am the cutest crocodile plush, you heard me"
NICI crocodile plush with his bewildered eyes looks deeply into the mirror in disbelief. The other NICI crocodile plush continued, "You asked for the cutest crocodile plush of them all, so the magic mirror's reply is ME, not you!" No, I am cutest crocodile plush! Not you, you imitation! I...am the cutest crocodile plush, YOU ARE THE IMITATION! Two NICI crocodile plush continues their argument. So which one do you think is cuter? YOU BE THE JUDGE! Hahaha, for me the two very nice, beatiful!! I thinking of ordering plush u want one? but this design i think at the moment only korean have.. let me know if u happen to see it in msia. Currently waiting for Korea side to give me the pricing and the freight charges. Cause don't know whether they using South Korea won or North Korea won. @Stephanie: hi Stephanie, Korea has reply me. They will be sending by DHL, and the currency they are using is South Korea Won. @Stephanie: he yet to give me the detail of shipping cost. But I already told him that I need three( one for me, u and jolly Mah) and ask him to get back to me. @hugo: yup.. I found out that only Korea hav it. Apparently I think china have it also, but I don't dare to buy from china.